Fresco by Raphael (1509) showing Plato and Aristotle. 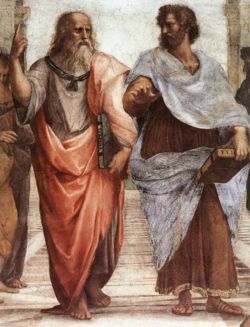 Plato is pointing toward the heavens and Aristotle toward the Earth. Philosophy involves the use of reason, logic, and argument in the search for truth and knowledge of reality. It is a systematic inquiry of the fundamental questions concerning the nature of reality (metaphysics), the justification of belief (epistemology), and the conduct of life (ethics), among other things. It principally focuses on causes and nature of things and of the principles governing existence, the material universe, perception of physical phenomena, and human behavior. Philosophy can be either spiritually or physically based. The nature of philosophy is itself a philosophical question that philosophers have understood and treated differently through the ages. Simply put, it is the love, study, or pursuit of wisdom or knowledge of things and their causes, whether theoretical or practical. As such philosophy leads to, or is also defined as, a belief (or system of beliefs), which is accepted as authoritative by some group or school. For the monotheistic religions, it is the study of all wisdom at the source (God), and of the principles of nature as the result of Creation. The term philosophy derives from a combination of the Greek words philos meaning "love" and sophia meaning "wisdom". Thus a philosopher is a 'lover of wisdom'. Whether dealing with the philosophy of religion, social behavior, science, et al., there are a number of components or branches that are seen as integral parts of one's philosophy. These include Ontology, Epistemology, and Axiology. Metaphysics is the branch of philosophy that studies the underlying principles or nature of reality and the origin and structure of the kinds of ultimate categories of those concepts. It is concerned with the study of First Principles (those that cannot be deduced from any other) and of being. Defined as such it is different from philosophical epistemology and so it is not in relation to the study of knowledge. Metaphysics involves thought about abstract concepts not at the empirical level of understanding found within scientific methodology. This includes topics like the mind and body, or what is called the mind-body problem within philosophy. Also there are existential topics like being, non-being and existence usually brought into focus under ontology. Additionally free will and theism are considered metaphysical topics. Classical theism is thought to expresses core characteristics of the Christian concept of God throughout its history as a philosophy and so Christianity is metaphysical. Metaphysics however in the broader more philosophical sense, outside of Christian theism, also interacts with empirical evidences through reason and logic, transcending past just space-time physical reality. Ontology is intimately connected with metaphysics concerning the nature and relations of being and existence specifically. Essentially the theory of being or the study of existence. Ontologists do not necessarily engage in trying to define what it is to exist but rather comprehensively address what actually does exist. Ontology does not deal in the specifics of existence like seeing if a species of bird is existing, nor does ontology address the even broader category of birds. Ontology actually deals with notions of whether anything even exists at all, immaterial, material, properties and relations, possible worlds and the like are all areas of study within ontology. It is impossible to do science without presupposing some type of metaphysical ontology. For example theists and atheists each hold a very different ontology. Whereas the former see the cosmos as an ordered construct of a divine being, and human being constitutes an immaterial reality, the latter (atheism) assumes the universe as only material and random chaos. Likewise, the evolutionist perceives humanity as nothing more than an animal, while the creationist regards humankind as created in the image of God. Ontological views provide a part of an underlying assumption (philosophy) that governs theories of science that intend to interpret some aspect of the natural world. Epistemology is the theory of knowledge and a core branch of philosophy that deals with limits, sources and methods of knowledge. According to traditional epistemology knowledge only requires Justified True Belief (JTB). A popular objection is that there seem to be varying degrees of intensity of belief about knowledge, from cautious to convicted. A particular degree of belief then may be what is required for knowledge not just a Justified True Belief. There can also be practical beliefs but these are based more on a positive attitude rather than epistemic justification. Propositions are fundamental and the objects of belief within epistemology. A true belief in a proposition is not the same as having Justified True Belief (JTB). As opposed to mere true belief a JTB within traditional epistemology has been brought under evidential verification (See: Evidentialism) within an intellectual environment suitable for proper cognitive function. When the proposition becomes verified it converts into JTB and then is often referred to as going through the tripartite analysis. Axiology is the component of philosophy involved with the study of the nature of values and value judgments or worthiness. Biblical axiology is the branch of theology dealing with the nature and types of value, such as law, ethics, conduct, order, and morality. In Matthew 22:36-40 Jesus said that all the laws hang on the commandments to love your God and your neighbor. Therefore, love is the basis for a Biblical axiology. Natural science began as a form of philosophy, called "natural philosophy" or "experimental philosophy". In the nineteenth century, the term "natural science" was increasingly used and science was seen as separate from philosophy since the methods and goals of science had become sufficiently distinct from those of traditional philosophy. Nowadays, scientists often ridicule philosophy as "useless" and philosophers as people who cannot agree on anything. Ironically, leading twentieth century philosophers gave science preferential treatment in their naturalistic philosophies. Science is often seen as presupposing a particular philosophy but that is not the case. Science is primarily a practical discipline; its standard is utility or "whatever works". It is only when science is asserted as true that it becomes a philosophy, called scientific realism. Then it must compete with other philosophies, something scientists are reluctant to do. In short, philosophy is concerned with what is the truth and science is concerned with what works. Religion is concerned with what is believed or should be believed. Science may be practiced by people with different belief systems; there is no need for uniformity of belief among scientists. Philosophy provides a discipline in which people of differing beliefs may seek common ground. In addition to being an example of the genetic fallacy, this statement confuses the practice of science with what people believe about science. Alternatively, others, including creation scientists, attribute the conflict between the theories to varying philosophical presuppositions which, they argue, affect a scientist's interpretation of the evidence. For example, David Bergman, a creationist physicist, attributes the conflict to two fundamentally different worldviews: on the one hand, atomism, which excludes supernatural action in the universe and holds that random events occur in nature; on the other hand, creationism, which holds that the universe depends for its existence on God, and that the laws of nature are a result of his design and plan. Evolution, he argues, is merely a modern iteration of the ancient philosophy of Lucretius articulated in his work, On the Nature of Things. Under this view, creation science is not "non-science" opposed to the "science" of evolution. Instead, both are "sciences" which are grounded in opposing philosophies, so that the same methods and same evidence lead to opposite conclusions due to the underlying philosophical assumptions of the scientist. Creation science is related to intelligent design, which differs in that its proponents claim to not make any theological assumptions, and intelligent design does not necessarily oppose evolution. Critics note that the intelligent design movement was started by many of the same individuals previously campaigning for creationism after attempts to get creation science in public classrooms met major opposition due to constitutional church-state separation issues in the United States. The mainstream scientific community considers creation science to be religiously motivated anti-science propaganda. The religious motivations of mainstream scientists are usually ignored, although leading scientists such as Richard Dawkins are openly championing atheistic religion. In addition to allowing for supernatural events in history, creation scientists also distinguish between what they call "operational science" and "origins science." Operational science, according to creation scientists, involves the laws and phenomena of nature which are repeatable and testable through experiment; for instance, the laws of gravity, chemistry, and microevolution. However, creation scientists assert that issues of "origins science" are different from issues of "operational science," because they involve one-time events which cannot be observed or repeated, but can only be inferred from the evidence. Asserted examples of such issues in origins science are common ancestry, the age of the earth, and historical geology, in which the ability of scientists to study the issues is limited by the available evidence, because the actual events cannot be observed first-hand. It is argued that in issues of "origins science," conclusions are much more tentative due to the unrepeatable nature of the events, that the conclusions are therefore much more subject to philosophical bias than in "operational science," and that "origins science" therefore admits multiple possible interpretations of the evidence. Creation scientists have accused mainstream scientists of being too reluctant to admit problems with their own theories. They believe that scientists in one discipline accept too easily the assumed structures present in other fields when doing their work. A growing number of scientists on both sides are recognizing a need to re-evaluate the confidence that science has in some of its basic presumptions, leading to, "An Open Letter to the Scientific Community." ↑ Scott, Eugenie C. "Antievolutionism and Creationism in the United States." National Center for Science Education, February 13, 2001. Accessed August 22, 2008. ↑ Bergman, David L. "Conflict of Atomism and Creationism in History." Common Sense Science, June 3, 2002. Accessed August 22, 2008. ↑ Arp, Halton, Torres-Assis, Andre Koch, Baryshev, Yuri, et al. "An Open Letter to the Scientific Community." New Scientist, May 22, 2004. Accessed August 22, 2008. This page was last modified on 15 August 2015, at 16:46.